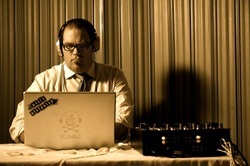 The companies' founder, owner, and operator, Brady McDonald has been DJ-ing for a while now and is committed to doing the best weddings in the business. Coming from a background of DJ-ing Large Dance Parties (3,000-4,000 people), DJ MAC knows how to read a crowd and keep people moving on the Dance Floor. He has entertained thousands of satisfied customers and knows that having a good time is relative to the energy brought by the DJ. There are also certain things that need to be present to get people pumped to dance, including Visual Lights, High Quality Speakers, and Pulsing Bass to keep the rhythm. This is all done without going overboard, and keeping your event elegant. He is a one man show guaranteed to bring the party! Hit 'em Up!